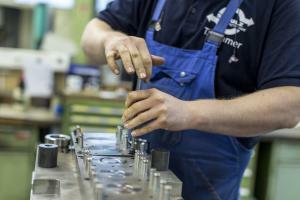 We know the different industry-specific requirements for stamped parts and parts suppliers. Therefore, our day-to-day work includes very demanding tasks, which we overcome speedily and process reliably. Even complicated customer requirements are never a problem for us, but are instead a welcome challenge. 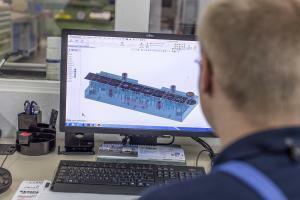 We construct the tools and equipment in accordance with your parts drawings, datasets, sample parts or the release of prototypes previously produced by us. Individual mass products with which your products can be produced reliably, fast and cost effectively are created in the tool production section of Schulz Stanztechnik. We can react flexibly to alteration or special requirements. We process highly precise individual parts for tools on modern tool machines which are constructed, mounted and tested in-house. Using modern 3D-CAD construction tools we can test various possibilities for production and variants of tool structures. In close cooperation with specialist firms for accompanying activities (e.g. heat treatment, coatings), we can implement your requests and demands. 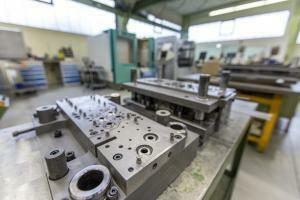 Also in the area of contract manufacture e.g. erosion, turning and milling technology etc. we would be happy to offer our services to you as a competent partner. I hereby confirm that I have read the Data Protection Declaration and that I accept it. Your ball caster and conveyance technology specialist!